My buddy Alex popped over last weekend with the new Chaos Codex in hand and a 50PL list that he would assemble out of my 30k Word Bearers Army. Alex’s current army, The Scourged, was up in Newcastle so Lorgar’s boys would have to do for the time being. This was also Alex’s first game of 40k and I was excited to both show him the ropes and to hear his thoughts on the new edition of 40k. The Dark Apostle accompanied by his possessed retinue. Chaos Space Marines (x10) – Two Lascannons, Power Fist. Possessed (x5) – Writhing Tentacles. Chaos Spawn (x1) – Mutated Beyond Reason. Chaos Land Raider – Two Twin-Linked Lascannons, Twin Linked Heavy Bolter. Ancient Tull is awoken for the engagement to come. Captain Bericus of the 4th – Storm Bolter, Relic Blade. Techmarine – Servo Arm, Power Axe, Bolt Pistol. Apothecary – Bolt Pistol, Chainsword. Tactical Squad – Missile Launcher, Flamer, Power Fist. Tactical Squad – Missile Launcher, Flamer, Power Sword, Combi – Flamer. Contemptor Dreadnought- Kheres Assault Cannon, Dreadnought Close Combat Weapon with inbuilt Storm Bolter. Dreadnought – Assault Cannon, Dreadnought Close Combat Weapon with inbuilt Storm Bolter. A combination of Sector Imperialis, TTCombat and scratch-built terrain on a DeepCut Studio urban mat. Deployment: Alex set up his Possessed and Dark Apostle inside the confines of the Land Raider, whilst squads of Heretics deployed in the gantry and ruins. The Malevolents concentrated their infantry on the eastern side of the board, whilst the two dreadnoughts deployed in flanking positions. The Heretic Astartes in the gantry enjoyed an excellent field of fire, sending concentrated beams of death upon the Tactical squad below with their lascannons and exacting a murderous toll upon their loyalist brothers. Turn Two: Opting for a less direct approach, the second Tactical Squad manoeuvres around the tower, blasting the Heretics with promethium and bolter fire. In a final, crushing tide of carnage, the Word Bearers are slain to a man. The ruined body of the Dark Apostle is tossed aside by the dreadnought… The Land Raider reverses swiftly away from the battle grid in a bid to survive the last turn. Battered but victorious, the Ancient holds the Malevolent’s banner high over the dead city. This proved to be a bloody game for both sides and tremendous fun too! The Ultramarines morale boost rescued me on several occasions and Alex was unlucky to fail his Dark Apostle’s charge upon exiting the Land Raider. The arrival of the dreadnoughts in turn three really saved my bacon and won the day for the marines. Next time, Alex vowed to focus fire on those lumbering giants early on, as well as bringing a bucket load of Tzeentchian trickery to put my Emperor fawning lapdogs in their place! This entry was posted in word bearers and tagged 40k, cityfight, gaming, space marines, terrain, ttcombat, word bearers on 23/08/2017 by darkfuture. Horus Heresy: Betrayal (the tome that ignited my imagination and convinced me to get into 30k) has been on my mind of late. I’ve been spending some enjoyable evenings within its pages, initially reading about the Death Guard and their role on Isstvan III. It is easy to forget just how awful and catastrophic that initial act of fratricide was. Of course Isstvan III overshadowed by the Dropsite Massacre on Isstvan V, but the scale is no less mind boggling. “Yes I saw it, the Life-Eater, a monster from the Old Time, human evil given form. Believed what I wonder? In the reality of the betrayal? In Gods? Was his belief in the Imperial Truth burst in that moment? We chose COUNTER THRUST, one of the Legendary Missions in the Betrayal campaign. The mission represents an attempt by the Loyalists to break out of a kill zone and do as much damage to the Traitor offensive as possible. So far, so good! Before the game I spoke with Dan about the scenario, explaining that I was going to take a foot heavy list ! Dan, in deference to the scenario, left his drop pods at home because why would the Wolves be drop podding down to break out of an encirclement? Oh, and the Traitors controlled all of Isstvaan’s space. I had played Dan’s Wolves on an few occasions before, but this would be the first time since their new rules broke. Dan explained them to me, but all I could hear was “stay well back – these guys will be on top of you and ripping you to shreds before you know it! Now although the Word Bearers are no slouches in hand to hand, (3D6 Leadership removing the highest) they would be wrecked by Dan’s large groups of feral infantry. My plan was simple: stay out of reach – Withdraw and keep pummelling them at range until they bled out. Dan would receive VPs for every unit of his in the break-out zone (my table half) and I would in turn receive VPs for every Wolf unit languishing in No Man’s Land. The Gal Vorbak I regarded as my ‘ace in the hole’ and was the only unit with a good chance against his murderous infantry formations. Now for the exciting part: Rolling up on the Mysterious Terrain Table! The bunker became an ammunition stockpile, with all weapons fired from within granted the shred special rule! The ruins in Dan’s deployment zone became a Charnel House – Dan would have to pass a leadership check if he wished to move through them. The Word Bearers ready themselves for the Wolves’ assault. Whilst the bloody melee continues, a thunderous explosion erupts behind the Space Wolves’ lines – the WB Vets, toting meltaguns, have destroyed the Venator, killing two more Grey Slayers in the blast… No one expects eh?! The Gal Vorbak prove to be as lethal as they are unnatural, tanking wounds and striking Garro down – only for the hero of the XIVth to get back up again! The Gal Vorbak strike again, exhibiting the horrific power of the warp. Garro is finally killed, along with a handful of Deathsworn. Rattled by the murderous toll, the Wolves break, only to be run down by the Last of the Serrated Sun. They begin feasting on the dead as a wrecked Predator smoulders behind. A huge thank you to Dan for being such a fun opponent and of course to BIG in Bristol for the fantastic table, terrain and venue. This entry was posted in 30k, Gal Vorbak, horus heresy, word bearers and tagged 30k, batrep, Gal Vorbak, horus heresy, isstvan, space wolves, word bearers on 25/05/2017 by darkfuture. 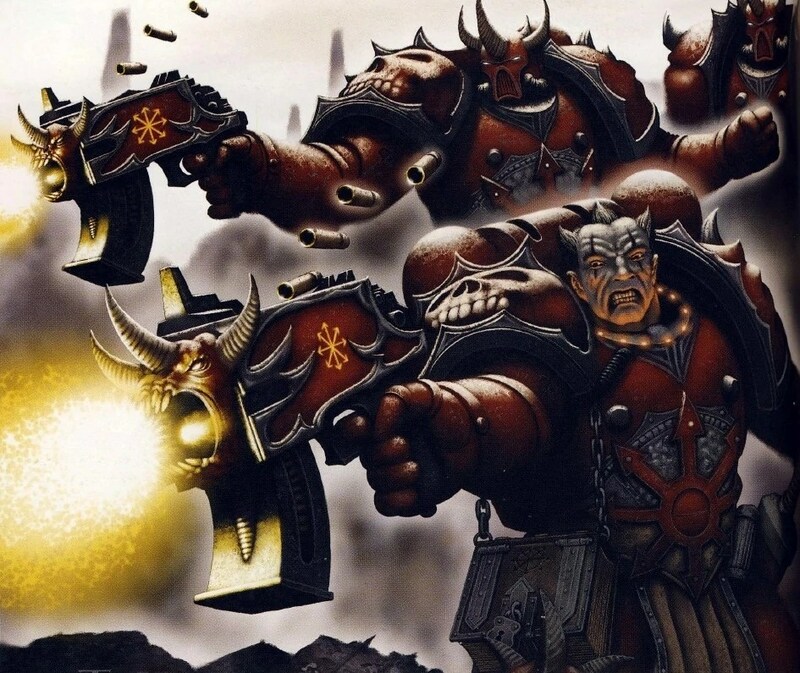 If I could give one piece of advice to those thinking about entering into the Heresy, it would be to play their Legion the way that it is intended. Not so that you can optimise your list or table your opponent, but because it’s the most enjoyable way to play. I resisted this for nearly two years, running various builds and rites of war with little success on the tabletop. Well, my tendency to run the army as a vanilla legion list (albeit with a 3D6 morale checks) is a thing of the past. From now on, I’ll be summoning daemons and calling upon all the help the Dark Gods can provide. After all, those loyalist loving dogs are no pushovers. In keeping with this gradual fall down the eightfold path, the Burning Horizon has recently had a unit of Gal Vorbak seconded to its ranks! I’ve heard a great deal about these guys and can’t wait to find out if they’re as scary as everyone says they are. Despite the addition of these daemonic troops, the Burning Horizon is still an armoured company. These guys will be getting a Phobos to run around in as part of either an Armoured Breakthrough or Armoured Spearhead Rite of War list. This entry was posted in 30k, Gal Vorbak, horus heresy, word bearers and tagged 30k, Gal Vorbak, horus heresy, word bearers on 23/04/2017 by darkfuture. Their Praetor, Zu’ul Na’gir, traces his origins to the motor-gypsy tribes of a world claimed by the XVIIth during the early part of the Great Crusade. Born aboard a tracked carrier, his mother died shortly after his birth, exerting her last grain of life to get her son to safety before the migratory swarms of xenoform locusts devoured the continent’s surface biomass. Inducted into the XVIIth some fifteen standard years later, the legionary displayed considerable aptitude for armoured warfare and frequently grew impatient with the methodical doctrines of his fellow officers. Zu’ul has a great many seasoned warriors under his command, and he is reluctant to let them slide off into oblivion. Mortally wounded legionnaires all too often awake to find themselves rehoused in the sarcophagi of Contemptor chassis, ready to serve the legion once more. Following Monarchia, the XVIIth accelerated their execution of the Crusade and Zu’ul’s expertise soon rose to prominence amongst his kin. He gained a reputation for rapid advances, and possessed an uncanny ability to identify and exploit weak points in the enemy battle lines. Nathagnol Mu’hur – Steel Centurion of The Burning Horizon and second in command. The vehicles under Zu’ul’s command held special significance for his Folio. Where others regarded their tanks and transports as mere tools, Zu’ul’s legionnaires gave them names, etched scriptures upon their hulls and painstakingly restored wrecked vehicles to their former glory. The chapter’s Motorpools and Engineerum decks were even converted into places of worship to ensure that the vehicles could attend the services. Yet it was on Istvaan V where Zu’ul gained true notoriety. Some four hours after the moment of betrayal, many Loyalists had managed, despite the crippling losses inflicted by this act of wanton fratricide, to form cohesive formations and hit back at their erstwhile brothers. One such sizeable formation of Iron Hands and Salamanders was inflicting significant losses upon the XVIIth; the Salamanders’ stubborn resistance, combined with the mechanical ingenuity of the Iron Hands, made for a formidable adversary. Worse, their commander was shrewd, using his armour to carve up unsupported Traitors that had overextended themselves in their advance, whilst evading traitor heavy battalions with tremendous skill. Upon hearing of this, Horus insulted Lorgar’s ability to direct his forces effectively, reminding him that every moment that passed on Istvaan would compromise the secessionists’ plan for total victory. At Lorgar’s personal request, The Crimson Revenant moved into low orbit, disgorging wings of Stormbirds, Stormeagles and Thunderhawk Transports. Within minutes, Zu’ul was on the ground, directing his forces from the cupola of his Land Raider Proteus, ‘Instrument of Ruin.’ The armoured spearhead had soon located the enemy formation, misdirected it and probed carefully for weaknesses via aggressive reconnaissance. The pseudo tank battle raged for hours, neither commander willing to commit his forces utterly for fear of a trap. Bluff followed bluff as Predator tanks skirted the lines and Land Raiders charged forth only to quickly dive back into the choking radioactive fog that enshrouded the Urgall Depression. It was one such piece of misdirection that finally proved to be the undoing of the Loyalists. A squadron of Zu’ul’s Land Raiders made contact with an Iron Hands Contemptor supported by infantry and a damaged Fellblade. In this engagement, a Land Raider was badly damaged whilst the rest of the squadron withdrew, giving cause for the Word Bearer’s within to disembark. Such a target as infantry in the open was too tempting for the Fellblade which moved into position to unleash its volkite cannon upon the target location. The infantry evaded the superheavy successfully, taking cover in a nearby arcology in the hope of mounting an ambush upon the enemy reconnoitre. Their opportunity came. The Iron Hands Contemptor advanced upon the stricken Land Raider, supported by a collection of Loyalist survivors. The Word Bearers watched as the Contemptor prized open the hull and ended the life of the mortally wounded tank commander. The Loyalists quickly got to work, ripping out the power coils and thermo packs of the Proteus’ lascannons and equipping themselves with salvage that could aid their own depleting motorpool. At this distance, the Word Bearer Stave Leader recognised the Contemptor as an ancient commander of the Iron Hands, a warrior of renown and deep significance. If the Iron hands would only commit here, in defence of one of their revered ancients, then the Salamanders would be forced to support them or submit to their forces being divided and destroyed piecemeal. Voxing his co-ordinates to the rest of Zu’ul’s Folio, the Stave Leader engaged. Six of his men were annihilated in a volkite inferno seconds after breaking cover. The Stave Leader, along with his three remaining faithful, survived the few minutes that it took for the Contemptor to be locked into a protracted firefight with the Land Raiders that had returned from their feigned flight. When reports came that the Contemptor had been immobilised, Zu’ul committed all of his forces. The gamble paid off. Children, the gods themselves watch o’er us now. In fire you march, in glory you tread. Hark! you etch our deeds upon the stars themselves. prayers and zeal;  Steel yourselves - now advance! The very Horizon Burns at our touch! This entry was posted in 30k, horus heresy, Uncategorized, word bearers and tagged 30k, fanfiction, gaming, general hobby, horus heresy, macromat, word bearers on 23/03/2017 by darkfuture. This might sound like criticism, yet it is the Land Raider’s ugliness, its impracticality, its sheer lack of suitability as a fighting vehicle that makes it so utterly appealing a concept. Humanity in the far future is bombastic in its arrogance. This young, violent race is absolute in its belief that it should hold sovereignty over the galaxy. In essence, the Land Raider is an allegory of that very sentiment given form: It is built upon the edifices of a glorious past; immovable in its dogma for 10,000 years, flawed, overblown, unwieldy, yet utterly lethal and capable of disgorging the finest soldiery in the galaxy. It may be driven by mortals, but it is a ‘machine spirit’ that ultimately governs its path. The Land Raider is truly a preposterous design that captures the imagination and is the very embodiment of the galaxy it inhabits. The Proteus is 180 points basic. For a four hull-pointed, twin-linked lascannon armed transport, this is tremendous value. Invariably these points stack up when you succumb to the temptation of upgrades. Not taking armoured ceramite is a serious gamble, although the prevalence of this upgrade has diminished the amount of melta taken in 30k, especially amongst the crowd I play with. Anyway – I never risk it, particularly when I take a step back and consider what purpose this vehicle serves: To keep your vulnerable troops safe until the critical moment. The Armoured Spearhead Rite of War enables the purchase of the Proteus as a dedicated transport for my Tactical Squads. Even on the lethal battlefields of 30k, a Proteus is capable of sticking around until late in the game, providing they are kept away from assault. This might not suit all play styles, but the Proteus is not an assault vehicle; it is in effect doing what the rhino falls short of – keeping your core units safe whilst laying down long range fire. Providing the rest of your force doesn’t crumble, this configuration will give you a fighting chance of a victory late in the game. For those favouring a more aggressive approach, take the Armoured Spearhead RoW and this time load them up with outflanking Veteran Tactical Squads. The arrival of two of these monsters on your opponent’s flank will be most unwelcome, particularly if their deployment exposes the enemy’s vulnerable rear or side armour. This will really shake things up and allows you to get close without having to drop 50 points on the prohibitively expensive Exploratory Augur Web. I’ve been amazed at how many games these things have survived. Their durability far outweighs their damage output and I’m happy for enemy firepower to be directed at these tanks rather than at my comparatively vulnerable Contemptors, Mhara Gal or other soft targets. It should be noted though that nothing dies quicker in 30k than tanks under assault from heavy infantry… Angron illustrated this with aplomb last week. Remember to keep them well back from angle grinding maniacs! Gun Platform. Metal Bulwark.Objective Taxi. Humanity Given Form. Bearer of the Burning Horizon Chapter of the XVII Legion. On Mars. It was on Mars you were born. Humanity’s Crusade was in its infancy and slow was the tread of man from its cradle. Fell xenos of every description, nightmare cousins and rival empires proved worthy adversaries for the fledgling Terran empire. It befitted the mightiest warriors, the Adeptus Astartes, to be ordained with the most formidable weaponry to smite those that would stand in the way of humanity’s ascension amongst the stars. You began as such, a weapon. But now, you are so much more. So it came to pass that a requisition order, bearing the seal of the Sigilite himself, commanded that you be made in the war forges deep within the Martian volcano of Olympus Mons. You and ten thousand others, rendered out of a sea of molten metal, stamped and beaten until you were given your true form. Fuel cells, engines and auxiliary systems filled your shell whilst hundreds of mechendrites coated you in ceramite. Your teeth were delivered across the Meridian plains; Lascannons from Hellas Minor, Heavy Bolters shipped from Pluto and a targeting matrix derived from the greatest minds of the Boreum-Neuro slums. Deep you slumbered amongst ten thousand of your kin; Racks of new forged blades, unbloodied within their scabbards. Astartes dignitaries visited you whilst you slept, regarded your chassis and marvelled at your potential. The bulk lifters soon departed, bearing you and your kin to the embattled expedition fleets. You dipped into the Emperyan. And out. Light years later, you met your legion. On the training grounds of Colcharis your engine sang for the first time. A defiant roar. A challenge to the galaxy at large. Legion service. Compliance they called it. Blood work. For two hundred years your treads have stamped the mark of the legion into unnumbered worlds; Your guns have mown down seething monstrosities, crystalline xenos, mutants and traitors all. You brought them the Word. You are a mighty instrument and a Bearer of brothers. You have bourn us through nuclear infernos, acid wash and alchem firestorms. You have enabled us to close with a thousand hated foes and brought your mighty ordnance to bear on those that we could not have bested unaided. We call you brother, for you have saved many of us, carrying us many leagues broken and bleeding to safety. We have bled together, you and I. You have outlived seven crews in your century of long service; On Dolgatha IV I saw you burn as weapons of infernal alien design immolated you from the inside; On Crix, the Druggandred, numberless and cunning, prized you open and gutted you. During the compliance of Huthra you fell for two miles when your thunderhawk was lanced. After each calamity I wept for you as I would a revered brother and each time we remade you where other Chapters of the XVII would have discarded you. The Burning Horizon has remade you many times, yet only once were you reborn. As the shroud was lifted and we gazed unblinking into the primordial abyss, you looked too didn’t you? Your crews tell me that you twitch and grumble down here, that you bellow in the dark of this hold and long for another war. You feel the rage as we do don’t you? I can see it – the yearning for fratricide. I sense that you long to test your mettle against your azure kin, adorned in the livery of the XIII. I’ve prayed for this. You’re no machine, not anymore. You’ve altogether tasted too much blood, taken too much life. Your Standard Template designates you as ‘Land Raider: Type Proteus.’ That is past. We within the Legion have given you the nomenclature ‘Instrument of Truth’ since your inception in the XVII. Yes, you have gone by many names. But I have heard the celestial whispers of choirs in the night. The Dark Monarchs themselves recognise you now, bearer of Zu’ul Nag’r Herald of the Horizon. I pronounce you ‘Athame of Oblivion’. This entry was posted in general hobby, Retro and tagged 30k, horus heresy, rogue trader, word bearers on 09/02/2017 by darkfuture. None should forget the near disastrous consequences of Angron’s uncontrollable rage. After infuriating Horus at Istvaan, Angron would continue to test the patience of his fellow secessionists. It is well documented that Angron’s fleet came close to initiating boarding actions with the Word Bearers flotilla at the outset of their campaign against The Five Hundred Worlds. Had it not been for Lorgar’s measured responses and the cool-headed courage of Angron’s lieutenants, then the Shadow Crusade would surely have been doomed from the start. It is true that both legions remained far from amicable. Blows were struck, even blood drawn, yet this soon gave rise to a grudging respect between the legionnaires of both Primarchs. * Soon their strategies synergised, forming a formidable fighting force that would cleave through hundreds of worlds. *It should be noted that outright battle never took place between the two legions in the prosecution of this campaign. On Culuxis XI, an agri-world on the fringes of The Five Hundred, the Word Bearers and World Eaters clashed. The Ultramarines were swift to evacuate their personnel when the secessionist fleets entered the system, narrowly escaping to their orbiting strike cruisers and fleeing to a neighbouring system where a meaningful defence could perhaps be mustered. The small world was left to its own defences, guarded only by tens of thousands of untested auxilia and a handful of oath sworn Ultramarines. The World Eaters fell upon them from orbit, sending waves of drop pods into the midst of the defenders. Within hours, seven of the eight primary hives had fallen, their populations either put to the sword or streaming outwards in panicked tides, choking the roads with refugees. The Word Bearers landed several leagues beyond these population centres, preferring to advance methodically, crushing resistance, and zealously indoctrinating terrified civilians. Often they would stop to practise esoteric rites, erect shrines and perform sacrifices, all in aid of fuelling the growing Ruinstorm. The world’s capital, Mal Reve, built long before by Culuxis’ first colonists, proved to be a formidable bastion, holding out longer than its neighbouring hives. Here, the World Eaters’ drop assault proved costly: Laser defence arrays lanced pods from the sky and hidden void shield generators denied the attackers viable landing zones. Every avenue was an ambush, every park a minefield and every plaza a kill zone. The auxilia here were well-drilled and, having received news of the massacres in seven of the other hives, resolved to fight to the last breath. Their master, Cato Bellicus, a Terran born Ultramarine beloved by the people, was both an inspiration and a tactical genius. Undeniably, the situation was hopeless for the defenders, but Cato determined to make the World Eaters bleed for every inch of ground they took. Fast becoming frustrated, World Eater commanders requested the armour and heavy ordnance of the Word Bearers to come to their aid. Distracted by dark rituals, none was forthcoming, despite the vitriol and stream of curses that flooded the vox. 71 hours from the first drop on Mal Reve, the head of Cato Bellicus was taken. The resistance quickly collapsed and the defenders took to the streets, all notions of valour turned abruptly to desperate survival. The hard fighting had caused the World Eaters’ nails to dig hard, taking hold in such a way that only continued combat, or potent sedatives, could calm the cerebral burn. Too few of their apothecaries had survived to administer the required dosages. It was at this juncture that elements of the Word Bearers sent to support the assault on Mal Reve arrived on the fringes of the city. A World Eater centurion, his battle plate streaked with gore and filth, advanced at the head of his forces to meet their allies. Through the rubble he came, over the buildings that had been collapsed on his brothers and across the strongpoints littered with Culuxian dead. The Word Bearers stood before him now, their crimson armour unbloodied and weapons still cold. Parchment covered with the rhetoric of their father fluttered in the blood and cordite tinged wind. It was a sight that made the nails bite deeper. Heartily gripping the vambrace of a trusted brother was a well practised battle greeting in both legions. Never though, had it ever been immediately followed by the severing of the gripped arm. A mixture of surprise and agony swept over the Word Bearer as he was head-butted and sent sprawling into a crater. The severed limb followed a moment afterwards, tossed contemptuously in by his attacker. Having wrecked the cortis, the XVII Legion contemptor talon turns to face a new threat – The Red Butchers deploy! “Gods! It’s Angron! ANGROOON!” The red-handed primarch sallies forth! Overwatch fire is ineffective, felling just two of the madmen! The tactical squads are annihilated in morass of flying limbs and reaving chainaxes! Two Word Bearers limp to the safety of their Proteus transport… Angron is only just getting started! Meanwhile, the Mhara Gal, immobilised and bereft of its plasma cannon, howls impotent rage at the foe! The red butchers stride through the remains of two wrecked dreadnoughts, shrugging off wounds as they are bathed in a wall of fire!. What a game! Thank you to Toby for an awesome time against his beautiful World Eaters army! This seemed to work rather well from where I was standing! World Eaters 8 – Word Bearers 6. Stand by for more Heresy action soon! This entry was posted in general hobby, Uncategorized and tagged 30k, gaming, horus heresy, word bearers, world eaters on 04/02/2017 by darkfuture. Conceptually, I think the Rogue Trader era predator is superb. The design evokes so much of the blocky, utilitarian aesthetic found in all imperial tanks. The sponsons, a design abandoned in most tanks within the first quarter of the twentieth century, seems to have finally found its place in the far future. But wait – there is a nod to progress; the domed turret and a pair of equally curved mountings to house the lascannons stand proud on that chassis of stubborn edges. The result is both incredibly archaic and oddly reminiscent of 50’s sci-fi. The XVII Legion needed armour, so immediate ebayage was necessary. The two models I received were in bad shape and needed some serious restoration. They were carefully disassembled and given a good soak in Dettol for about two weeks. After cleaning and drying, the reassembly phase revealed a new host of problems: Attaching the track sections to main hull exposed gaps where the plastic had either degraded or warped over time. Plenty of green stuff and a few choice accessaries later, the pair looked fairly presentable and I deemed them to be ready for priming. It was the inspiration to run the Armoured Breakthrough Rite of War that originally led to this purchase. With this ROW the predators become fast vehicles with scoring that can also be taken as Troops. One of them is automatically boosted to a ‘Super Heavy Command Tank.’ Nice! The 24” re-roll for leadership is useful, but with the Word Bearers rolling 3D6 and selecting the lowest two already, this is formidable, as is the BS2 upgrade. The predators’ purpose is clear: To keep their distance, stay alive and secure late game objectives with a well timed flat out move. Should I opt to be more aggressive, they could tear up the enemy’s flanks, drawing away other units from my core, or position themselves midfield for those opportune rear and side armour hits. This is another miniature that I badly wanted when I got into the hobby in the mid-nineties but was sadly unavailable. Now, thanks to the wonders of the online marketplace, they are finally mine. I’m really pleased with how they have turned out and integrated into my army of 30k Word Bearers. Their comparatively small size initially gave me pause, but since they are ‘Fast’ owing to the ROW, they now fit both aesthetically and thematically. At the time of writing they are unbloodied, but they don’t have to wait long – I’ve got a 3,000 point game scheduled tomorrow against World Eaters. This entry was posted in general hobby, Retro and tagged 30k, 40k, horus heresy, rogue trader, word bearers on 02/02/2017 by darkfuture.